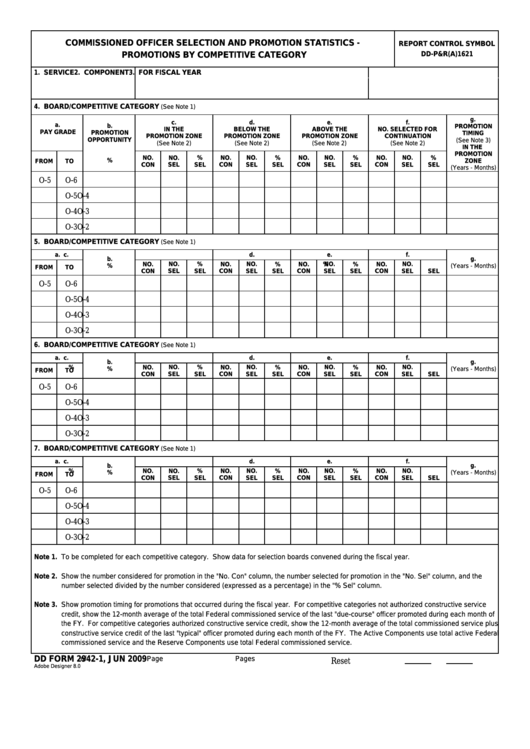 Download a blank fillable Dd Form 2942-1 - Commissioned Officer Selection And Promotion Statistics - Promotions By Competitive Category in PDF format just by clicking the "DOWNLOAD PDF" button. Complete Dd Form 2942-1 - Commissioned Officer Selection And Promotion Statistics - Promotions By Competitive Category with your personal data - all interactive fields are highlighted in places where you should type, access drop-down lists or select multiple-choice options. Note 1. To be completed for each competitive category. Show data for selection boards convened during the fiscal year. number selected divided by the number considered (expressed as a percentage) in the "% Sel" column. commissioned service and the Reserve Components use total Federal commissioned service.